How does windchill impact decisions to delay or close school? Wear layers of loose-fitting, lightweight, warm clothing. Trapped air between the layers provides insulation. Outer garments (coats) should be tightly woven, water repellent, and hooded. Wear a hat, because 40% of your body heat can be lost from your head. Minimize exposed skin. Use a scarf to cover your nose, mouth, and cheeks. Wear a cap that covers you ears. Wear mittens or gloves that are snug at the wrist. The windchill chart above shows time to frostbite for exposed skin. Cold weather is not dangerous in and of itself. It is the length of time one is exposed to the cold which creates a potential danger, particularly for exposed skin. Area school district circumstances are unique. City schools, for instance, have students that walk to school for up to one mile. Having walkers means the city school district superintendent must consider longer exposure times for their students than for rural districts. Mohawk has no walkers. The exposure times that we must consider are the exposure times required of students waiting to be picked up at their bus stop. Students are asked to be at their stop 5 minutes prior to their pick-up time. We do not expect total exposure times for students to exceed 10 minutes even for students that have a short walk to their bus stop. Decisions to close or delay due to cold temperatures are related to our ability to insure that student exposure to the cold and wind stay below the “times to frostbite” in the chart above. 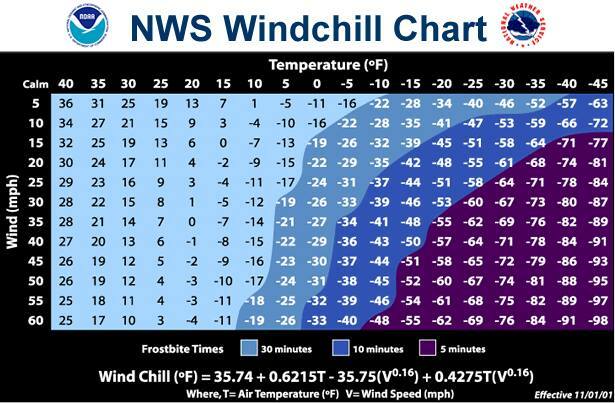 A closure or delay because of windchill would occur when a significant risk exists that a student would be exposed to cold and wind for a time above one of the “times to frostbite” in the above chart. A delay due would occur if temperature and windchill were anticipated to increase significantly over the 2-hour delay period. I hope this correspondence helps clarify the impact of wind chill on closures and delays. Let’s hope for less severe temperatures. If you have questions or concerns, don’t hesitate to contact me at 419-927-2414.